← Sri Lanka off to a winning start in World T20. 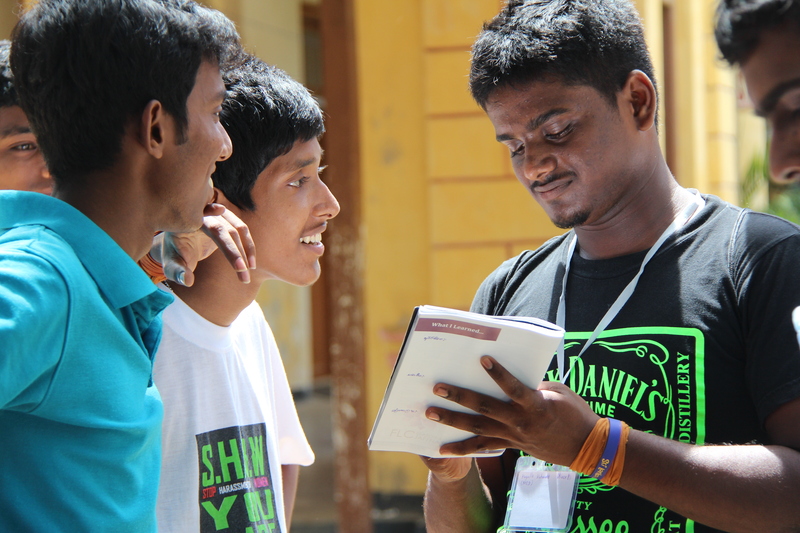 Three members of the Gecko committee were fortunate to have the opportunity of volunteering at the Sri Lanka Unites Future Leaders Conference in Jaffna at the end of August. This annual four-day youth conference, now in its fourth year, brings together students from schools all over the country to share their experiences of the civil conflict, identify and engage with a variety of social, ethnic, educational and economic issues facing Sri Lanka, and suggest proactive ways in which youth and civil society can help in solving or alleviating such issues for the betterment of the country. Inspired by a range of speakers form a variety of backgrounds and professions, the students are given a framework of activities (including dialogue and discussion as well as sports and team-building), facilitated by their “mentors”. Gecko was proud to support the Future Leaders Conference this year, by providing funding for 5 students to attend the conference. Below follows my personal reflections of the conference from volunteering as a mentor. Having heard about the conference through the Sri Lanka Unites United Kingdom branch, I decided to volunteer as a mentor for this year’s edition, largely because I knew I would be in Sri Lanka anyway for my medical elective. Also, as a project Gecko has supported I was curious to see what the experience would be like. I had no idea what to expect. I had never been to Jaffna. I could not speak Tamil, and would not count myself particularly fluent in Sinhala. As it happened, FLC 4 was an incredible experience. I cannot possibly convey all of the events and emotions that shaped these few days in one blog post, but I will highlight a few thoughts and memories that were personally poignant for me. I am a Sri Lankan (okay, a second generation British Sri Lankan). I have lost count of the number of times I have visited country (must be at least ten!). But, like many of my co-volunteers and many of the participating students, this was my first visit to Jaffna, a city steeped in history and culture. We as Sri Lankans should be grateful most of the historical sites have been preserved in their glory, despite thirty years of war. The beaches and lagoon are things of beauty. The majority of my time however, was spent at Jaffna College in Vaddukoddai. It was very special for all of us to be there and feel like for a week we were really a part of the college; to walk the grounds, to eat in the dining halls, to sit in the auditorium, to sleep in the hostels (or even classrooms!). Many thanks to those involved in Jaffna from SLU and from Jaffna College. The rapturous ovation that greeted a video clip featuring images of Jaffna from hundreds of students, from all around the country, on day 3, is an image that will never escape me. For many of them this will have been the first time they embraced this city as a proud element of “Ape Lanka”. This year’s conference brought together over 400 students (aged 15-18) from 75 schools, representing 22 out of Sri Lanka’s 25 districts. They came from different communities, ethnicities, religions and crucially, spoke different languages. For many students this was their first interaction with someone from a different ethnicity or community, which would have been daunting enough, but was even more overwhelming given the immersive experience of the conference format. On the first day the students are separated from their school classmates and integrated with their counterparts from all corners of the country into a “team”. These teams are named after different districts (e.g. Kandy Knights); the idea being that the students cheer for a district that is not their own, thus challenging established geographical/ethnic/religious loyalties to their “home” and encouraging them to forge a sense of unity despite their diversity. For the next four days of the conference, from dawn until dusk (literally! ), the participants remain with their team; they eat, drink, play, and sleep together, as a team. This presented a number of challenges but also great opportunities. Through various dialogue exercises, students were encouraged to share their individual experiences of the civil conflict. For example, the construction of timelines charting events of personal or historical significance related to the conflict brought out many powerful and heartrending experiences which will never leave those who they were shared with. As the students grew in confidence they found ways of overcoming the language barrier to communicate their ideas. They had a new space to tell each other about the issues facing their own communities at this time and understand each other’s experiences. By the end they were inseparable, bound by a new understanding borne out of personal interaction and genuine friendship. For me personally, FLC 4 was a unique opportunity to connect with the people of my motherland in all their diversity, as I had previously interacted largely with Sri Lankans coming from a similar ethnic and economic backgrounds to my parents. This in itself I feel has brought me closer to the country as a whole. The sight of hundreds of young people on the last day, united as one, committed to a brighter future for all their new friends, surely carries promise. Reconciliation is about people and humanity. Once the barriers are broken, there is less scope for animosity between communities. This was shown in a symbolic pledge of commitment and faith by a group of students from Matara, as they embraced their counterparts from Mullaitivu with the following promise “Api ogolongwa amatak karane na” (We will not forget you). I for one won’t forget the smiling faces of those students from this war-torn district, nor the tears of my students during the closing ceremony. A motto publicly endorsed by Sri Lanka Unites, but more than just rhetoric. The penultimate day of the conference empowers the students to identify particular social, ethnic and economic issues and suggest practical solutions that youth and civil society can implement at a grass-roots level. The collective commitment to break from the prejudices inherited from their own communities and tackle social injustices and welfare hardships through youth driven projects is so encouraging to see. If this great energy, belief and togetherness could grow, setting off a chain reaction, inspiring change around the country, who knows what could be achieved. To this end, the students are encouraged to “spread the message”, setting up their own Sri Lanka Unites chapters in their schools, forming partnerships with schools in other areas, running their own initiatives to combat the issues they have identified, and learn the language that is not native to them. I will quote an analogy used by Sri Lanka Unites President Prashan De Visser during the conference. First he instructs everyone to tap one finger on their right hand against one finger on their left, symbolizing one person’s commitment to change Sri Lanka for the better. One person influences another and becomes two (two fingers tapping against two fingers). Two becomes three, three becomes four, and before you know it there is a massive wave of applause around the auditorium. As I mentioned previously, reconciliation is about people, and if we underestimate the need to promote understanding, extinguish ethnic prejudices and embrace a Sri Lankan identity enriched by its diversity, we will surely fail. It disappoints me that in the eyes of some, Sri Lanka Unites carries the image of a superficial “hug and make-up” organization, without a commitment to action. In being a non-political and non-governmental organization they tackle issues at a grass-roots level within civil society with various initiatives, more details of which can be found on their website (www.srilankaunites.org), Facebook and Twitter. The Future Leaders Conference is about inspiring the youth, tomorrow’s leaders, to be part of that change, and make a difference in their own communities. I won’t for a minute deny that there are political issues that need resolving if true reconciliation is to be achieved. However, I feel that work at the grass-roots level such as that which Sri Lanka Unites are doing is at least equally important, and it should not be forgotten, overlooked or compromised. Perhaps we will only be able to truly judge the impact of such initiatives in many years time. If the dream of a truly united Sri Lanka that other nations will aspire to is realized, I hope I will be able to look back and say “I was part of the change”. It is perhaps apt that I post this on the International Day of Peace, which Sri Lanka Unites hopes to celebrate by releasing a Youth Pledge for Reconciliation, encompassing the proactive and creative ideas suggested by youth at FLC4. It is intended that this will be sent to the Government of Sri Lanka and the major political parties, to show how youth can play a significant role in tackling difficult issues in Sri Lanka. For more information about Sri Lanka Unites and the Future Leaders Conference, please visit their website (www.srilankaunites.org), Facebook (www.facebook.com/SriLankaUnites) or Twitter (twitter.com/SriLankaUnites). Sri Lanka Unites has recently established a chapter in the United Kingdom, which runs various events engaging the Sri Lankan diaspora. Visit www.facebook.com/ukslu for more information. Gecko Sri Lanka is a UK registered charity founded in the aftermath of the 2004 Boxing Day tsunami by a group of second generation Sri Lankan students. This entry was posted in events, news, sri lanka, Uncategorized and tagged FLC, Future Leaders Conference, peace, reconciliation, sri lanka. Bookmark the permalink. hi its a great work and fee so proud abt you as a volunteer who was being SLU future leaders conference.keep on updations.